What can we expect from Shimano 2015? This is a preview of the 2015 Shimano line up written before the official press launch. Click here for full details of the new 1×11 Shimano XTR drivetrain. This week sees the big Shimano 2015 press launch — and once we’ve been there, we’ll be sworn to secrecy for a while about what we’ve seen. So before that embargo takes effect — and before we know what the company has planned for next year’s products — let’s indulge in a little speculation. And then we’ll try to bodge together our own prototype to see what it’s like to ride. We expect Shimano to launch an electronic mountain bike groupset for 2015, either at the XTR level or XT, or both. In fact, it has all the necessary hardware already. 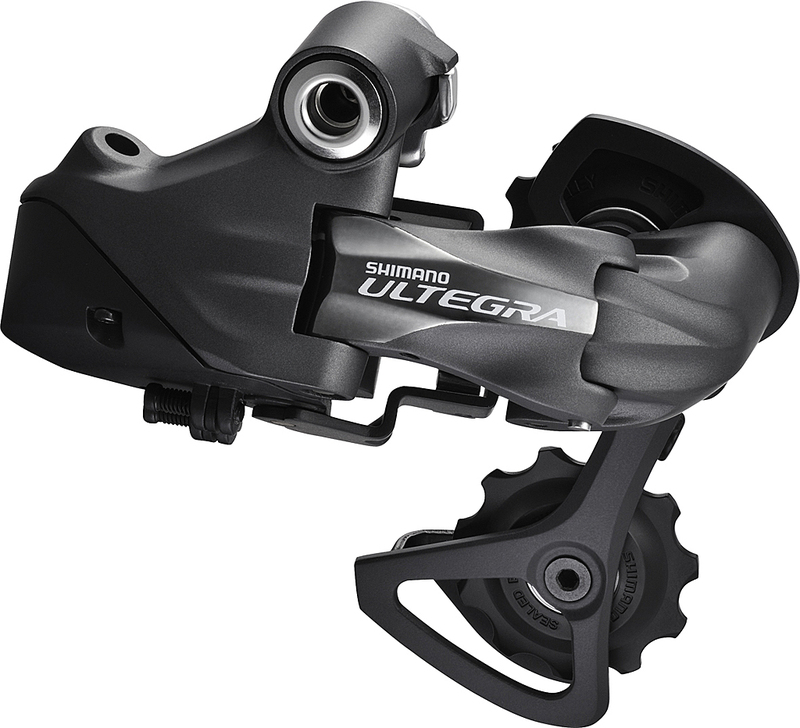 The latest Ultegra Di2 road groupset features a GS caged rear derailleur with increased capacity to accommodate a larger 11-32 tooth cassette, and it’s not a massive step from that to 11-36. Ultegra’s electronic Sprint Switch could easily be packed into a single STI unit, or Shimano could just miniaturise the shifter/display it currently uses with the Alfine Di2. The front derailleur would need a wider cage, although with the mech’s autotrim feature it might not actually be that necessary. The plug-and-play E-tube system would make it easy to set up, and Di2 rear derailleurs already have a breakaway feature to protect the motor, which is even more relevant for off-road riding. If it rides anything like the road stuff, it’s should be truly stunning. That’s the theory — now for the practice. Here’s what happened when we built a Di2 mtb electronic drivetrain using already-available Shimano components. We used a mixture of Shimano’s second-string Ultegra road and Alfine hybrid parts to build our drivetrain. We decided on 1×10 for simplicity, but we had to compromise on the gearing because the Ultegra Di2 derailleur won’t work with anything bigger than a 28t sprocket (it’ll increase to 32t for 2014). The 30×28 bottom gear we ended up with is useable, but it will definitely test your fitness. 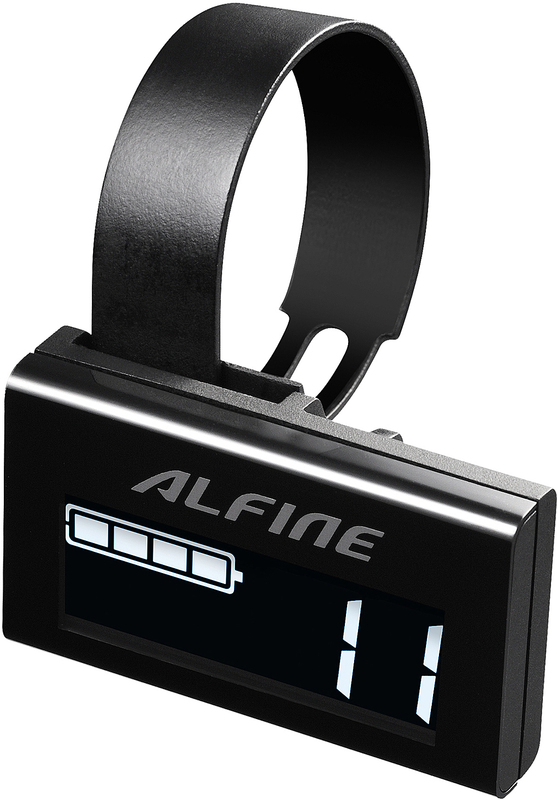 The other piece we needed for our 1×10 puzzle was a 10-speed trigger shifter, and new to Shimano’s 2014 product range was a SW-S705 Alfine Di2 shift switch. 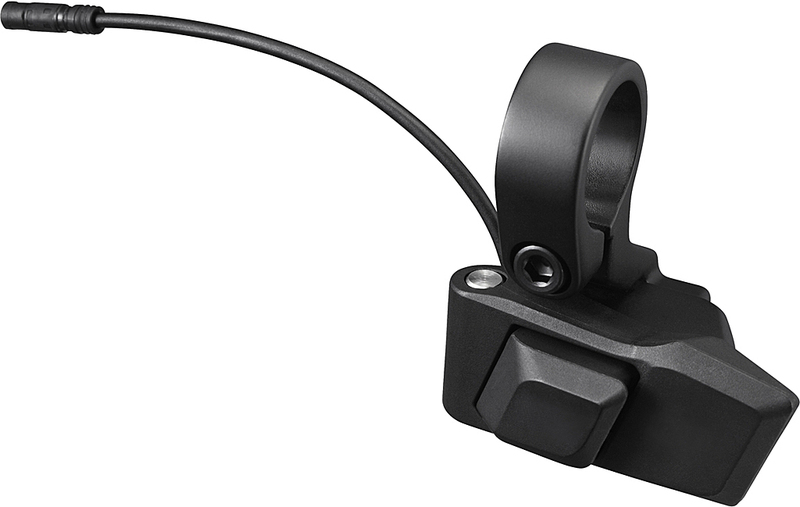 This push-button shifter can be configured from eight to 11-speed use. Fitting the components together was straightforward — the first Di2 road products had fixed cables, but thanks to newer plug-and-play technology, it’s just a case of plugging the groupset together. The one component that may prove tricky is the battery. We had to mount ours on a K-Edge GoPro Saddle Rail Mount, because our test bike lacked a bottle-cage mount, which is where the Di2 battery goes on a road bike. Due to the mixture of parts, we had a slight glitch with the firmware in the individual components and they failed to work together. After a quick diagnostic, which involved plugging everything into a laptop (welcome to the future), we had the green light. One of the features of Di2 is the ability to change the speed of the shift. There are five speed settings, from ‘very slow’ (similar to the speed of a manual shift) to ‘very fast’, which is what we opted for. There are also three settings for multi-shift, by which you can change through multiple gears by simply pressing and holding the shift button — you can choose two, three or infinite number of shifts. The latter means the derailleur can shift across the whole cassette until it can’t move any more, and that was the setting we picked. The shifter, or rather the switch, has a very light action and requires no force to make a shift — it’s like pressing a button on a mobile phone. In the fastest setting, there is no detectable delay between pressing the switch and the derailleur moving. It is also totally silent, and more than once we had to look down to see if we really had changed gear. With very little lag, Di2 feels precise in muddy conditions, and during our test there was no deterioration in the quality of the shift or even the break-in period you get with a conventional system as the cables bed in. The light action and speed of the shift takes a bit of getting used to, and there were times when we felt it was a bit too quick. When shifting in a lower gear on a steep climb it’s very easy to mis-time the shift, because the derailleur moves before the shifting ramps on the cassette sprockets come into alignment. With a manual shift, you can feel when there’s a lot of strain on the drivetrain and you can back off accordingly, but with electronic, the derailleur just shifts regardless. This resulted in a few clunky shifts early on, but after a few rides, we started to pre-plan our shifts more carefully. 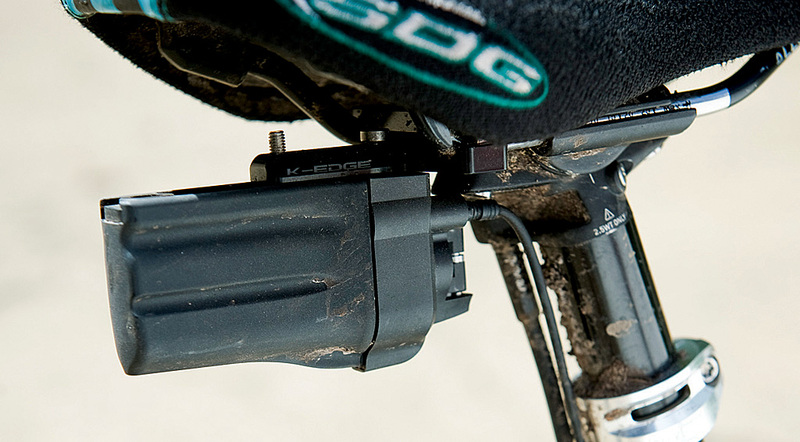 There are several things that Shimano needs to address before it launches MTB Di2. The rear derailleur needs to be slimmed down and needs a clutch mechanism, because the bulky motor does stick out quite far, making it vulnerable to damage. The road derailleurs have a crash-saver function, where the motor breaks away in a spill and also inner cage impact protection — both will need to feature on the mountain bike derailleur. The cabling also needs to be more robust, especially on the exposed areas at the rear derailleur — maybe with some form of protective sheath or reinforcement. Shimano also needs to beef up the way the E-tube junction box mounts on the bike, because the thin plastic tag holding it is too flimsy. There is work to be done before we see a fully-fledged Di2 MTB groupset, but we’re convinced it will become a reality. Shimano will probably run manual and electronic drivetrains in tandem, like it does with the road groupsets, but as the technology becomes more affordable it might trickle down to XT and SLX. Our custom drivetrain allowed us to sample electronic shifting off-road for the first time, and while it’ll feel more integrated as a complete MTB groupset, there are some obvious benefits for mountain bikers. Faster shifting might not be important for all riders, but consistent and reliable shifting that won’t deteriorate over time is a big step forward. The Di2 components are really easy to set up, and if you do break something, you simply remove the damaged part and plug in a new one. With electronic shocks, forks and now dropper posts on the horizon, it’s only a matter of time before we see the first fully electronic mountain bike. Will our predictions come to pass? We’ll find out this week — and you’ll find out as soon as we’re able to tell you. In the meantime… power to the people.